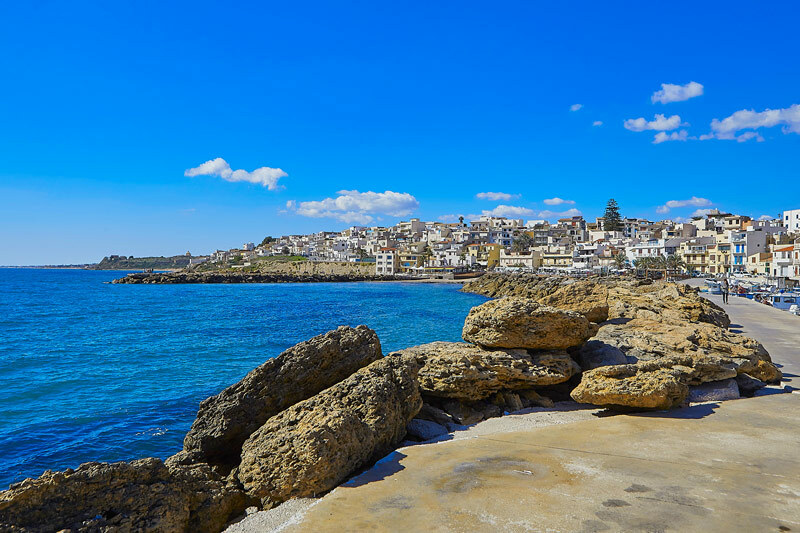 From Palermo or Trapani passing through the Castellamarre del Golfo motorway junction in the direction of Mazara del Vallo, in little more than an hour you can reach an extraordinary place on the southeast coast in the Castelvetrano council district. The Selinunte archaeological park is one of the most extensive in the Mediterranean and walking around it you will not simply find yourself among a load of ruins but feel the sensation of finding yourself in a V-c.-BC Greek city where the temples, but also the walls, the aqueduct, the streets, the burial grounds, and the small family dwellings are easily recognisable. You will be struck, above all, by the sigh of it all together in a Sicilian countryside smelling of minty nepitella (Clinopodium nepeta) and other Mediterranean herbs, above a golden beach lapped by the sea stretching out to Africa. It is in fact a herb, wild parsley, in Greek sèlinon, that gives its name to this city built in the VII c. BC. Selinunte was rich and powerful enough to even found a colony, Eraclea Minoa (another nearby site worthy of a visit) though its glory was short-lived, only 240 years. Founded in 650BC, it fell in 409BC defeated by an alliance between Segesta - a long time rival - and Carthage. 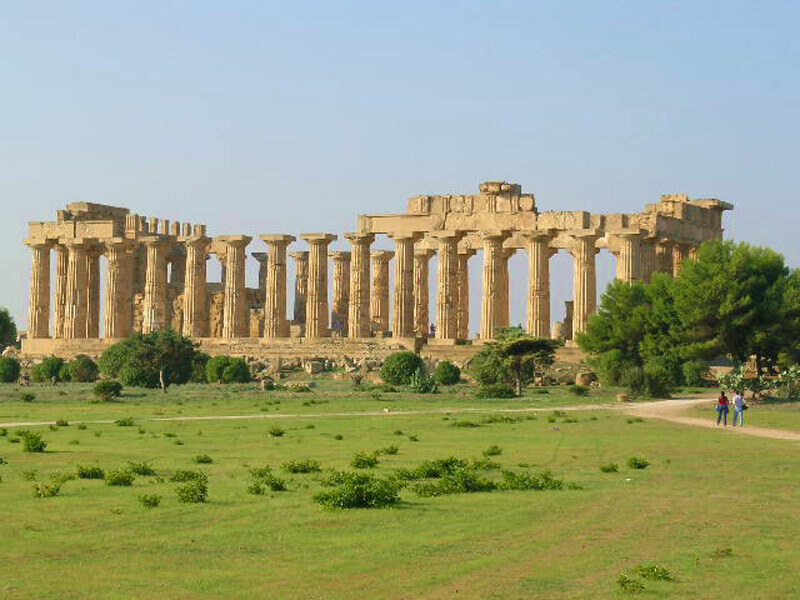 Archaeological excavations were begun in the early 1800s by English scholars who understood the importance of the site, though the actual archaeological park was set up in the 1960s thanks to the passion and intelligence of the Sicilian archaeologist Vincenzo Tusa. The layout of Selinunte is quite complex: set between two rivers (the Modione-Selino to the west and the Cottone to the east) the city stands on two pieces of high ground joined by an isthmus, the Acropolis stands on the one nearer the sea and it is characterised by the crossing of two main streets and the temples identified by the letters A, B, C, D, and O, on the other lie the remains of the town dwellings and two necropolis. Other important vestiges are to be found flanking the sides of the central zone, across the rivers: three large temples stand to the east - E dedicated to Hera, F and G, the largest, perhaps dedicated to Apollo - and another necropolis; to the west lies a sanctuary dedicated to Demeter - also called Malophòros, i.e. the apple bearer - and the oldest necropolis. The two city gates stand at the respective river mouths. The extremely interesting Cave di Cusa lies 10km west of Selinunte and supplied the enormous stone blocks for building the temple columns. The impression you get is that the circular blocks were hastily abandoned in the midst of work and are still waiting for someone to come back and collect them. Another must is The Castelvetrano civic museum that houses the famous Efebo bronze statue found during the 19th c. among the ruins of the archaeological site. The "Efebo di Selinunte" is a thin-waisted youth caught in the act of pouring out a drink-offering to a god. It was exquisitely made between 480 - 460 BC and is well worth the visit. To admire much of the pottery and sculptures found at the site, among which the wonderful temple E metopes, you need to go to the Salinas Archaeological Museum in Palermo where much of ancient Sicily’s finds are held. You can, though, go for a lovely swim in view of the acropolis in the bracing waters off Marinella beach, a long stretch of golden sand that goes as far as the nature reserve at the mouth of the Belice river.